The DART board has voted to not renew the paid parking program at Parker Road, North Carrollton/Frankford, and Belt Line stations and the Northwest Plano Park & Ride. The program would effectively end on April 2, 2014 but DART will also create a reserved parking area at Parker Road Station for residents of the DART service area in the Parker Road Station parking lots east of Archerwood. 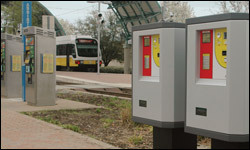 Fair Share Parking was originally launched at two stations in April 2012 as a two-year pilot with a goal of addressing overcrowding at end-of-the-line stations and the need for equity between service area residents and non-residents, according to Todd Plesko, DART’s vice president of planning and development. The program was very effective in pushing non-service area residents to other stations. Forty-five percent of non-residents shifted down the line, filling the George Bush Turnpike Station to 90-percent capacity and causing overflow traffic at the Trinity Mills Station. And while bettering equity at Parker Road and N. Carrollton/Frankford stations, it worsened at Trinity Mills and George Bush Turnpike stations. Details on the reserved parking program for service area residents at Parker Road Station will be available before the Fair Share Parking program ends on April 2, 2014.. This entry was posted in DART Board and tagged carrollton, paid parking, plano. Bookmark the permalink. We need to have reserved parking for service area residents at the North Carrollton/Frankford Road station as well. Prior to the paid parking implementation, residents were very often forced to park in the lot across the road leading into the warehouse district. The main lot routinely fills up today even with paid parking, so it will only get significantly worse. Please consider providing this main lot as reserved parking for service area members. All the added vehicles and overflow at Trinity Mills will just move back to North Carrollton/Frankford Road when this changes.